Posted on Wednesday, September 26th, 2018 at 10:45 am. Cross season is here and while many undoubtedly have all their rig(s) ready to go, I don’t. I have an unhealthy tendency to procrastinate till the very last minute, so if you’re like me, or if you’re in the market for a good durable cross bike, may I introduce you to a bike that I lovingly test rode for months. The impeding cross season reminded me how much I love and miss this Sage PDXCX. The story started late winter of 2017 when the bike showed up at my house a few days before Christmas. Cross season was pretty much over by then, but I figured I can do a combination of ‘cross and gravel riding since gravel is the rage these days. Plus, I was curious as to how titanium, the darling material of choice before it was totally blindsided by the emergence of carbon, would change the ride, if any. So Sage treated the build as one would expect from a small customer builder: customization. Based out of Beaverton, Oregon, owner and designer Dave Rosen was very hands on in terms of getting the right build. I opted for a 52cm frame and Dave built my test bike with a 2x Shimano Ultegra R8000 mechanical grouppo, TRP HY/RD cable-actuated hydraualic disc brakes, an ENVE Cross disc fork, Hed Ardennes Plus LT disc hoops with versatile Donnelly PDX 700x33C tires, a 3T cockpit with 2.5mm Lizard Skins DSP bartape, plus a Selle Italia SLR saddle. The PDXCX is available as frame only for $2,900. Our 18.9lb test bike was $6,625. Sage outfitted the build with Shimano Ultegra R8000 crankset with 46/36 chainrings for the purpose of cross and gravel riding. Grippy Lizard Skins DSP 2.5mm Bartape was the right choice between the less padded 1.8mm and the really cushy 3.0mm version. Old-school reversing pulley for the front derailleur. ENVE Cross fork with plenty of mud clearance. You can say that’s an awful lot of money to be spend on a bike when you can get something lighter for less. But I digress. I love the PDXCX. Designed by Rosen and manufactured by titanium specialist Lynksey in Tennessee, the 3V/2.5Al titanium alloy frame features a double-butted ovalized toptube, a bi-ovalized downtube (also double butted), an oversized 44mm headtube, with a nod to both the old school and the new school thoughts of what a cyclocross geometry should be: A modern short chainstay coupled with a longer front end mated to a higher bottom bracket similar to traditional euro cross bikes. 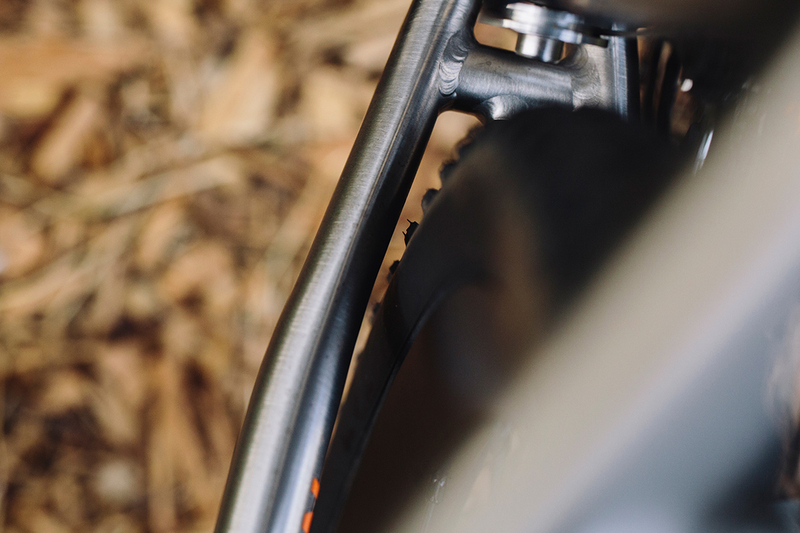 t’s further dotted with little details such as a reversing pulley for the front derailleur, a patented interchangeable cable routing system to keep all the cables tidy whether you are running either mechanical or electrical groups, a 1X or a 2X. 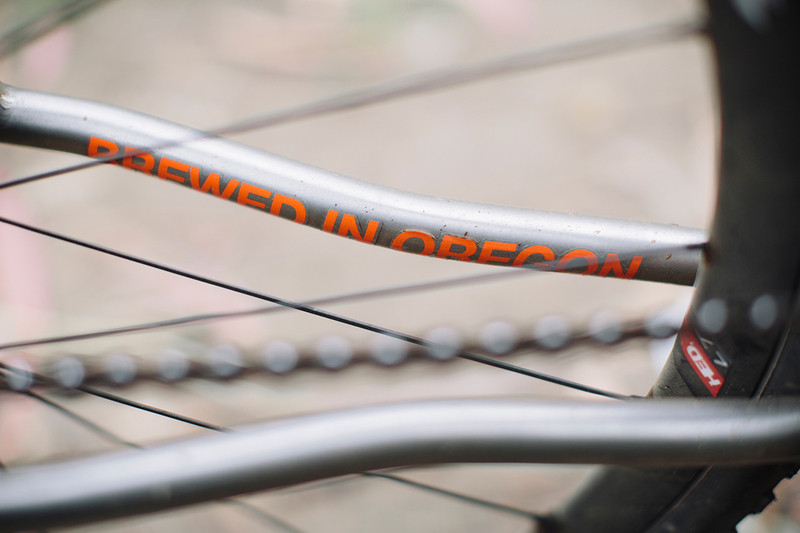 The PDXCX also comes with a traditional bottom bracket, a 142×12 rear dropout, and mounts for fenders. It’s clear Rosen spent a lot of time tinkering it through and through. 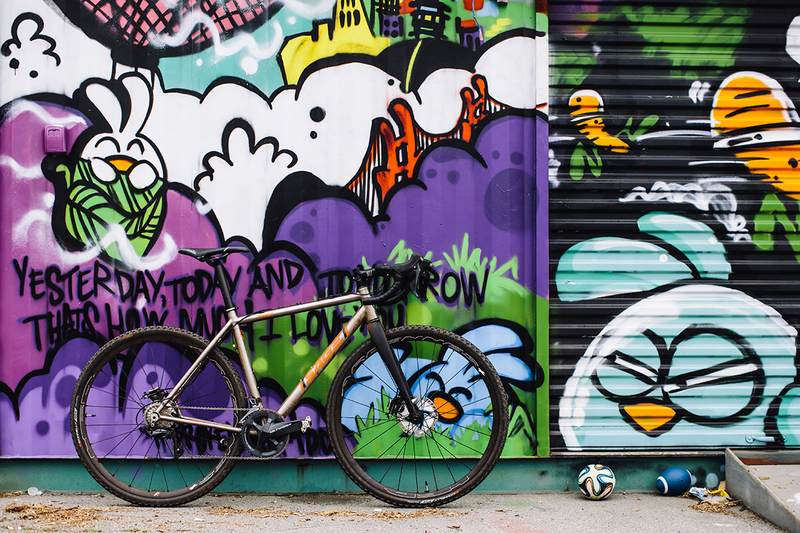 The PDXCX is a very easy bike to work on – something a privateer would appreciate, like its brushed finish with removable decals where replacement decals in ten different colorways are readily available. Rosen would also be happy to refinish your frame to make it looking brand-new for a mere $50. Again, they’re the small details that make this bike enticing for those who plan to keep their bikes for a while. Rosen envisioned a nimble race machine to slice through technical courses and often muddy tracks of the Pacific Northwest, and the bike delivered. 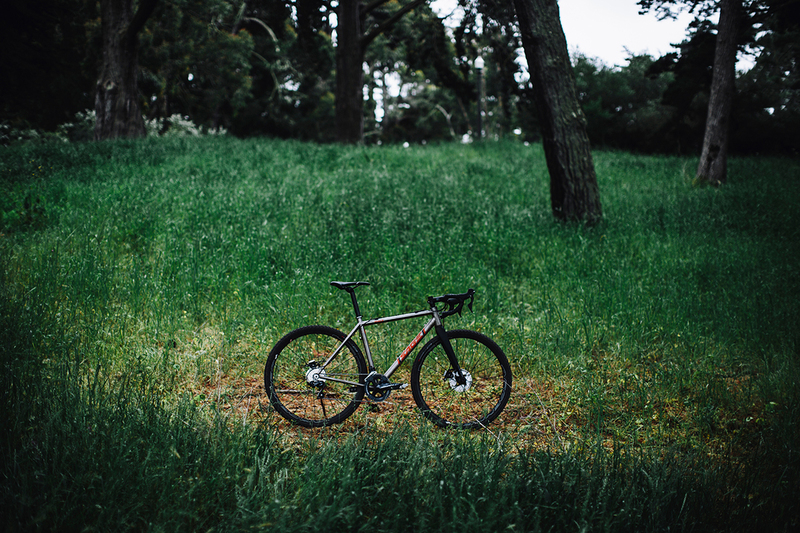 The PDXCX is aggressive and stiff like a well-tuned race car where its sole mission is to get you to places – fast. I found the PDXCX to be a comfortable race bike… but it’s still a race bike, and prospective buyers should understand that any bike won’t be automatically magical just because it’s made out of titanium. You can’t compare a suspension of a Toyota Camry to the suspension on a Porsche 911. The PDXCX offers a firm ride, and I like that. There are cushier, more laidback cross bikes out there, but I like the PDXCX for its playfulness and razor-sharp handling in tight courses. I’d give Sage’s gravel frame, the Barlow, a look if I was to do more gravel riding than ‘cross whereas the PDXCX is great for CX racers who like to do some occasional mixed terrain rides. I encountered a few issues with our test bike. First, the 3T Zero25 seatpost is beautiful and offers both zero and 25-degrees of offset in a flip of the clamps, but our seatpost slipped twice during our testing despite being properly torqued. It finally stayed in its place after we torqued it for the third time. Second, while the Ultegra R8000 grouppo worked flawlessly with the dual chainring being a welcoming sight on longer mixed terrain rides, I never warmed up to the TRP HY/RD cable-actuated hydraulic disc brakes. Sure, they modulate well and will stop, but they lack the power of the hydraulic offerings from Shimano or SRAM. The TRP HY/RD cable-actuated hydraulic disc brakes got a nice brake feel but lacks power compared to hydraulic brakes from the likes of Shimano and SRAM. Tire clearance is also a point worth noting. Sage noted the PDXCX will clear 42c tires, but our 33mm Donnelly PDX tires measured out to be around 36.7mm on our caliper on the 25mm-wide HED rim, with about 4mm of clearance left on either side of the chainstay… A 42mm tire is going to be a very tight squeeze. Other than these little things, the PDXCX was as good of a race bike that I could ask for. So yes, if I am planning to keep a highly capable and spirited cross bike for a long while, I’d give the Sage PDXCX a serious look.